Home Software Solutions Barcode & RFID Complete Software Solutions Jewellery Labelling Solution - Printer + Labels + Software. Jewellery Labelling Solution - Printer + Labels + Software. 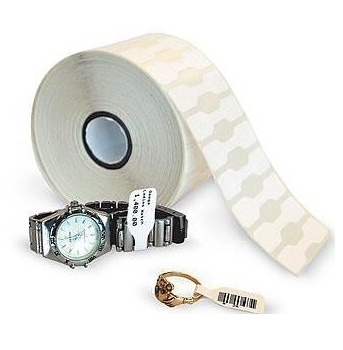 Complete jewellery label solution - everything you need to design and print your own jewellery labels: thermal transfer printer, professional label software, jewellery labels and ribbon. Easy to set up and use, within half an hour you can be printing your own jewellery labels. Dumbbell and rat-tail high quality jewellery labels self-adhesive tabs featuring a non-adhesive middle to wrap around the jewellery to fit without leaving residue.